Our moon arrived at Jupiter today, so close (just half my 9x63 aperture) that no Galilean satellites were visible (they were IG/CE). 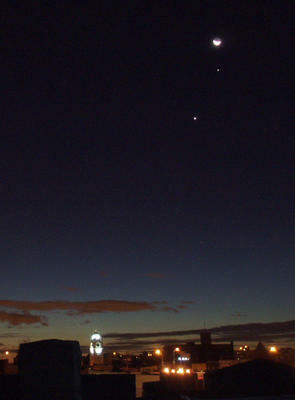 Venus and Jupiter now take up almost a full length of my aperture. This is the closest that the moon will get to either planet this month (1.5 degrees perhaps). I took many photos, most from my window, and ventured for only 2 or 3 minutes onto the roof, so cold has it become. Very beautiful sight. Great photo, Kevin. There's something to be said for the juxtaposition of a city skyline and the lights of the heavens, despite all my complaining. Thanks for your comments on my blog, by the way. I hope you will post your planetary bodies essay soon. I think you have a more expansive view of the universe than I do; I like to put my planets in little well-defined boxes (because that helps my limited understanding of how the universe works) while you like to be more inclusive and leave the way open for future discoveries. So I am looking forward to your essay and will approach it with an open mind. I may learn to love little icy KBOs nearly as much as their terrestrial and gaseous cousins nearer to home! thanks, Beche, and I'll look for more photos on your blog. My essay's up now. You anticipated a lot of my remarks about the need for expansive models. I admit there's such a thing as being too expansive, though, and that's where I think a pro astronomer would be more disciplined. I'm waiting for Bad Astronomer's promised essay.